We’d love your help. Let us know what’s wrong with this preview of Never Eat Alone by Keith Ferrazzi. Do you want to get ahead in life? Climb the ladder to personal success? The secret, master networker Keith Ferrazzi claims, is in reaching out to other people. As Ferrazzi discovered early in life, what distinguishes highly successful people from everyone else is the way they use the power of relationships--so that everyone wins. In "Never Eat Alone," Ferrazzi lays out the Do you want to get ahead in life? In "Never Eat Alone," Ferrazzi lays out the specific steps--and inner mindset--he uses to reach out to connect with the thousands of colleagues, friends, and associates on his Rolodex, people he has helped and who have helped him. The son of a small-town steelworker and a cleaning lady, Ferrazzi first used his remarkable ability to connect with others to pave the way to a scholarship at Yale, a Harvard MBA, and several top executive posts. Not yet out of his thirties, he developed a network of relationships that stretched from Washington's corridors of power to Hollywood's A-list, leading to him being named one of Crain's 40 Under 40 and selected as a Global Leader for Tomorrow by the Davos World Economic Forum. Don't keep score: It's never simply about getting what you want. It's about getting what you want and making sure that the people who are important to you get what they want, too. "Ping" constantly: The Ins and Outs of reaching out to those in your circle of contacts all the time--not just when you need something. Never eat alone: The dynamics of status are the same whether you're working at a corporation or attending a society event-- "invisibility" is a fate worse than failure. In the course of the book, Ferrazzi outlines the timeless strategies shared by the world's most connected individuals, from Katherine Graham to Bill Clinton, Vernon Jordan to the Dalai Lama. To ask other readers questions about Never Eat Alone, please sign up. Raul, ¿qué tal este libro? Hace tiempo que lo vi pero no me decido. ¿Lo recomiendas? Camilo Esta muy bueno, especialmente si eres un tipo de persona que no ve el por que detras del networking. This book is a huge elitist bragging session for Keith Ferrazzi. I picked it up to get some tips on networking for a new business we're starting and it eventually began grating on my nerves. I'm not sure how many times it's necessary to congratulate yourself in your own book about how great you are, but the author went above and beyond that limit. A large network is great but I am not about to start proclaiming that having hundreds of people as contacts is what's going to make me successful. Get This book is a huge elitist bragging session for Keith Ferrazzi. I picked it up to get some tips on networking for a new business we're starting and it eventually began grating on my nerves. I'm not sure how many times it's necessary to congratulate yourself in your own book about how great you are, but the author went above and beyond that limit. A large network is great but I am not about to start proclaiming that having hundreds of people as contacts is what's going to make me successful. Get a grip. He needs an ego check. Any valuable points made in this book could have been summed up in a small 5 page essay. nothing authentic here. i need to stop picking up cheetos-colored books. In my efforts to spread the word about OptimWise, my technology services company, I've been attending more local workshops, lectures, and networking events. After hearing a few people recommend this book for networking advice, I decided it'd be worth my time to check out. It's too early to tell whether this book will improve my networking skills, but I'm definitely optimistic. Ferrazzi packs the book full of advice, tips, and anecdotes from his personal life. To add credibility, he also reference In my efforts to spread the word about OptimWise, my technology services company, I've been attending more local workshops, lectures, and networking events. After hearing a few people recommend this book for networking advice, I decided it'd be worth my time to check out. It's too early to tell whether this book will improve my networking skills, but I'm definitely optimistic. Ferrazzi packs the book full of advice, tips, and anecdotes from his personal life. To add credibility, he also references a few studies and statistics. The book's title comes from Ferrazzi's recommendation that you never eat alone; he uses sharing meals as an example of one way to include others in whatever you're doing. Ferrazzi's main idea is that instead of cold, calculating, traditional networking, you should make genuine friends. First make friends, he says, then make them clients. The more people you know, the more opportunities will come your way, and the more help you'll get. Your circle of influence will widen naturally. Early on, he says you must find your "blue flame": the intersection of your passion and talent. This is where you can be most successful. Then, share your passions; invite people into your personal life by sharing meals, hobbies, and events. This will lead to the friendships required for his form of networking. Another point he hits several times is reciprocity; again, not in the traditional "I'll scratch your back if you'll scratch mine" way, but giving without keeping score, then benefiting from the inevitable return of favors. He says to give generously and ask for generosity from others. I agreed with most of Ferrazzi's ideas, but not with one he presents at the very end. He proposes that there's no such thing as a work/life balance, because if you like the people you work with and the work you do, there's no need to distinguish between work and personal life. I don't buy this, because although you can become friends with colleagues and business partners, it's not always possible to work with your family and friends, the people that we most enjoy spending our time with. Ask not what people can do for you, but what you can do for them. 1. Set goals for every 3 months and year, 3 years out. 2. Identify the people, places, and things required to meet those goals. 3. Reach out to the people who can help you achieve your goals. Create a board of advisors to act as cheerleaders and supervisors. Be bold and willing to ask; it never hurts to ask. Become an active member in clubs, and work up to being a leader. Meet 1 new person per week, no matter where or how. Research people before meeting them to find common interests. Invite people from different parts of your network to events so they get to know each other. The quality of time you spend with people is more important than the quantity. Connect with "superconnectors" (well-connected people outside your profession). Avoid safe, boring talk. Talk about religion, romance, politics, and your passions. Listen attentively and use people's names. Help people with the 3 most important things: health, wealth, and children. Become an indispensable power broker, helping others succeed. Ping your contacts at least a few times each year to stay in touch. Birthdays are the best time. Throw dinner parties with a mix of people. Use "anchor tenants" to bridge to others outside your social circle. As someone who feels skeptical about business and networking and most things professional (i.e. elitist), I came into this book with low expectations. Never Eat Alone looks like another career-oriented self-help book aimed at elevating one's wealth and making connections to get ahead. And while it does focus on both of those things - relationships, how to sell yourself and your brand - I appreciated Keith Ferrazzi's emphasis on vulnerability and kindness. He advocates for caring about other people and using that concern for others as a platform for genuine, professional growth. His comments about vulnerability surprised me in a pleasant way, because they shattered the idea of of always maintaining a flawless image to get ahead in the working world. A few of the other highlights in this book include: the idea of finding your blue fame (where your passion and practical abilities intersect), Ferrazzi writing that we should introspect more about our values and that we should seek therapy if we want it, and his note to stay humble, even when you feel like a great success. I have a few critiques of Never Eat Alone, too. Ferrazzi states that networking gets a bad rep for being a shallow, non-authentic activity. While he urges us to view networking as an opportunity for genuine connection, which I loved, I still felt that throughout the book his conceptions of networking aligned with the negative stereotypes he aimed to avoid - a more thorough or refined analysis of connection-making may have helped him craft a unified message about the ethics of networking. He also could have allocated more attention to issues of privilege and disparity, as he himself comes from a disadvantaged background. Certain people in society (e.g., affluent white men) can benefit from his strategies with ease, while minorities will have to work so much harder to succeed; I wish he had included more tips on how to not feel encumbered by a less-privileged background. And, my last critique: I could not stand the title of this book. I have my bias; as an outgoing introvert, I like to eat alone as a break from interacting with people all the time (and I read this book while eating alone several times, too.) Either way, the title simplifies the book's meaningful messages in a way that does not serve them justice. I forget how I first came across this book, but it seemed to be one of those (like Blink, The Tipping Point, The Wisdom of Crowds, etc.) that was getting a lot of press on blogs that I read frequently. Ferrazzi has an interesting blog for Never Eat Alone and Phil Terry of Creative Good suggested I give it a go to help connect with folks at the Gel conference this week. The book is about how to meet people and develop deeper relationships more quickly. Ferrazzi shares his philosophy on life--you can't succeed without the help of others--and outlines strategies to make connecting easier. These strategies are a reinforcement of the Golden Rule, and they boil down to things like: Always looking to help or connect people, Have a story to tell, Show vulnerability first to make the conversation more intimate, Become indispensible in one specific area to become more valuable to your company, Ping your contacts at least once a quarter, Do your homework; make sure you know details about the people you will be meeting, Be bold; believe you have something to offer and others will treat you as such, and Speak at, or start a conference to develop your personal brand. TL;DR It's better to know everyone in the world than not know them. Great networking book. Filled with wisdom. Loved it. I sat through a brilliant networking lecture a few months ago and I kept thinking about how much more good you can do in the world if you have built relationships with people. The lecture really got me thinking about the value of building relationships with others in order to better serve them. I taught a lesson about it at church...and got such a dead response. After the lesson, a friend suggested this book that he had previously read and brought it by for me to read. I spent the next week devo I sat through a brilliant networking lecture a few months ago and I kept thinking about how much more good you can do in the world if you have built relationships with people. The lecture really got me thinking about the value of building relationships with others in order to better serve them. I taught a lesson about it at church...and got such a dead response. After the lesson, a friend suggested this book that he had previously read and brought it by for me to read. I spent the next week devouring it. It seemed to be a culmination of everything I'd been learning about and thinking about up to this point. It mentioned several characters (Benjamin Franklin) and books (How to Win Friends and Influence People) that I just love. I thought the author had many valid points. It seems to be human nature that if you help people, they will help you. Give, and you get, or so my life experience has taught me. The book seems to follow in a similar style to How to Win Friends and Influence People, which gives you a selfish reason to be nice, here he gives you a selfish reason to reach out, to give, to create and support communities. Ultimately, I think these principles are intrinsically good. They bear value even if there is nothing in it for the giver. Both books have manipulative undertones. I've come to realize, however, that saying 'look at all the good you'll generate by living by these principles' isn't as persuasive as 'look at how much money you can make or how loved you can be by living these principles'. Humans are generally motivated by 'how will this benefit me'. Thus, even though he often discussed the non-altruistic side of networking, I still think his book is effective in both persuading and teaching readers to network more, and more effectively. - a commando knows that you have to get people to like you first. The sales come later—in the follow-up discussions you have after the conference. - If 80 percent of success is, as Woody Allen once said, just show-ing up, then 80 percent of building and maintaining relationships is just staying in touch. Мне лично прочитать книгу очень хотелось хотя бы потому, что я - выраженный интраверт, с людьми схожусь долго и вдумчиво :) Именно поэтому было вдвойне любопытно поверить столь противоречивые отзывы о книге собственными впечатлениями. Считаю, что тема отношений (построения, поддержания, развития, использования и др.) в ближайшие лет 5-10-20 в нашей стране будет только набирать свою актуальность. Причина проста: социальный уклад СССР разрушен (включая социальные нормы построения и поддержания отношений); "коллективизм" и "общинность" - не более, чем исторические или мифологические понятия. Стране сделали прививку капитализма - с изменением системы социальных ценностей; с расслоением на богатых и бедных; с креном в абсолютную "свободу" для каждого и "индивидуализм". Проще говоря - грядёт эпоха Великого Одиночества, когда каждый сам по себе. В худшем случае - это "война всех против всех". В частом случае - это всем на всех напевать ("всё равно"). В лучшем случае - сбиваемся в группу, объединенную общей наживой, и дружно топаем к социальной ценности "богатство" ("благосостояние"). "Цивилизованный" (развитой) капитализм на Западе вроде бы научился справляться с этим самым Одиночеством (а м.б. просто болезнь загнали вглубь?). А у нашего российского общества, "укушенного" капитализмом - всё ещё впереди. Что понравилось: В вопросах тактики (т.е. в конкретных способах и приёмах создания / поддержания / развития отношений) книга очень хороша! Часть рекомендаций можно смело отнести к созданию персонального бренда. Что вполне логично: чтобы люди захотели общаться с вами, надо что-то представлять из себя. Часть советов посвящена навыкам общения, вопросам этикета и организации деловых (но при этом "неформальных") коммуникаций. В общем, книга из разряда "сам себе пиарщик" :) , но написано довольно толково. Что не понравилось: на уровне стратегии книга содержит очень серьезное противоречие. С одной стороны очевидно, что связи и отношения с другими людьми - не самоцель, а всего лишь стредство для достижения других ценностей и целей - карьерных высот, богатства, популярности и т.п. Книга написана "из образа" эдакого драйвового тусовщика, рубахи-парня, который всем (а у него 5000 фамилий в записной книжке) направо и налево "отдаёт". После чего благодарные партнеры по отношениям "возвращают" ему всё сторицей. Книга как бы про альтруистическую игру, про совместное развлечение "милых" людей. Но на самом деле в этой игре работает другая логика: если контакт мне необходим для достижения каких-то целей, то я концентрируюсь на отношениях именно с данным человеком (в это время ничего не "отдавая" другим). Мало того, я не "отдаю", а инвестирую разного рода ресурсы (не бесконечные!) в эти отношения :) И если эти инвестиции не дают результата? Если другой человек привык только "получать", а "отдавать" ничего не собирается? Повторюсь: любые отношения - это игры обмена, а не некий мировоззренческий бескорыстный альтруизм, как это пытается представить автор. Следовательно, в этих играх бывают проигрыши (о чем не пишет автор). Следовательно, существуют условия, ограничивающие игру обмена, а также правила её прекращения в случае выхода за ограничения (о чем также молчит автор). Резюме: Читать было интересно :) С учётом описанного глобального противоречия в стратегии, книга заслуживает крепкой "троечки". Я все покращувала і покращувала своє враження від книги чим ближче доходила до кінця. Справа в тому, що спочатку мене відштовхнула дещо зверхня, як мені здалося, манера автора описувати свій досвід як єдино правильний. Та з певної глави я зрозуміла, що ця своєрідна щирість Кейта Феррацці - нагода для добродушного сміху і більшої довіри до його порад. Адже автор не намагається прикрасити своє вміння налагоджувати і підтримувати велику мережу контактів, вміло використовувати їх для своїх цілей, пр Я все покращувала і покращувала своє враження від книги чим ближче доходила до кінця. Справа в тому, що спочатку мене відштовхнула дещо зверхня, як мені здалося, манера автора описувати свій досвід як єдино правильний. Та з певної глави я зрозуміла, що ця своєрідна щирість Кейта Феррацці - нагода для добродушного сміху і більшої довіри до його порад. Адже автор не намагається прикрасити своє вміння налагоджувати і підтримувати велику мережу контактів, вміло використовувати їх для своїх цілей, проектів і задумів, бо він і справді спеціаліст у цьому. Разом з тим, він підкреслює, що таке будування мережі стосунків буде успішним лише тоді, коли ми навчимося віддавати, ділитися, думати про вигоду іншої сторони на стільки ж як і про свою. Особливо корисними мені були останні розділи книги, в яких подані розкішні ідеї того як організувати вечірку в себе, щоб зібрати людей зі спільними інтересами та з різними можливостями. Тут Феррацці ділиться практичними порадами з організації контактів, їх оновлення, частоти "нагадувань про себе", привітань. Ну от, читаєш, спочатку аж дивно і неприємно від "штучності" всього процесу, а з кількома сторінками, розділами стає зрозуміло, що це підхід відвертого Феррацці, я ж можу застосовувати його в тій мірі, яку буду вважати прийнятною для себе. І ще хочу похвалити цікаві розповіді з біографій відомих людей, які розміщені вкінці кожної глави. Вони дуже доповнюють сказане в розділі на реальних прикладах. Disciplined dreamers all have one thing in common: a mission. The mission is often risky, unconventional, and most likely tough as hell to achieve. But it is possible. The kind of discipline that turns a dream into a mission, and a mission into a reality, really just comes down to a process of setting goals. Throughout his career, Bill Clinton’s political aspirations and his ability to reach out to others have gone hand in hand. He made it a nightly habit to record, on index cards, the names and Disciplined dreamers all have one thing in common: a mission. The mission is often risky, unconventional, and most likely tough as hell to achieve. But it is possible. The kind of discipline that turns a dream into a mission, and a mission into a reality, really just comes down to a process of setting goals. Throughout his career, Bill Clinton’s political aspirations and his ability to reach out to others have gone hand in hand. He made it a nightly habit to record, on index cards, the names and vital information of every person whom he’d met that day. After writing down the information about someone he just met, Clinton said, “I’m going into politics and plan to run for governor of Arkansas, and I’m keeping track of everyone I meet. Don’t wait until you’re out of a job, or on your own, to begin reaching out to others. You’ve got to create a community of colleagues and friends before you need it. Others around you are far more likely to help you if they already know and like you. Every time I make a call or introduce myself to people I don’t know, the fear that they might reject me is there. Then I remember the Big Wheel my father got me, and push ahead anyway. It’s not necessarily strong contacts, like family and close friends, that prove the most powerful; to the contrary, often the most important people in our network are those who are acquaintances. This book goes into the Top 10 Must Reads that I recommend to everyone in every profession. The principles of "connecting" strike a nerve of truth that gives power to the actionable steps the author suggests. I love the new vocabulary that this book gives us in reference to networking. Essentially we learn in this book that relationships are our greatest assets and that our best relationships are those in which we create high value for people we care about. This is the skill that must be honed. This book goes into the Top 10 Must Reads that I recommend to everyone in every profession. The principles of "connecting" strike a nerve of truth that gives power to the actionable steps the author suggests. I love the new vocabulary that this book gives us in reference to networking. Typical Business 1.0 good-old-boy network "what can you do for me?" advice. If this guy asked me to lunch, I'd be immediately suspicious of his motives. My god. This was too wishy-washy and self-helpy that I had to put it down after 40 pages. This was a great book about what networking really is. It's about sharing information with people, not just about managing transactions with people. Here are some quotes that I liked from the book. 3. Every successful person I’ve met shared, in varying degre This was a great book about what networking really is. It's about sharing information with people, not just about managing transactions with people. 10. The ability to distribute knowledge in a network is fairly easy to skill to learn. b. For business bestsellers, check out the Wall Street Journal’s list in the Personal Journal section on Friday. d. Now pick a few people, some of whom you know well and some you don’t, and email them your work. Having read many books in the past about the art of networking and how to build connections for a successful life and career, I find Keith Ferrazzi's "Never Eat Alone" to be an especially great book on this subject. Many of the ideas here are not revolutionary or new since the concept of networking has become, as the author puts it, a "lingua franca of our times". Of course, you'll find chapters on well-worn topics, such as "being interesting," "follow your passion", or "the art of small talk". 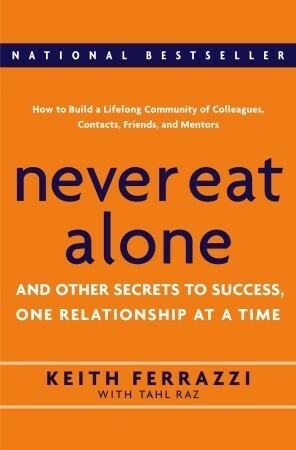 Having read many books in the past about the art of networking and how to build connections for a successful life and career, I find Keith Ferrazzi's "Never Eat Alone" to be an especially great book on this subject. Many of the ideas here are not revolutionary or new since the concept of networking has become, as the author puts it, a "lingua franca of our times". Of course, you'll find chapters on well-worn topics, such as "being interesting," "follow your passion", or "the art of small talk". Nonetheless, this book is a great read for 2 specific reasons: (1) making connections should be a lifestyle choice, rather than an opportunistic chore one does occasionally to advance in life; (2) it is possible to cultivate a mindset and a set of skills to establish sincere and worthwhile relationships in today's world. Some books have become overly cynical about why and how we connect to others. Networking has often been treated as a kind of trickery or manipulation à la Machiavelli, a necessary means to achieve specific ends, such as finding a job, or moving up the power ladder. Ferrazzi's book was able to tread a delicate balance between advocating authenticity and kindness in building relationships and giving practical advice on how to network effectively and maintain different kinds of professional and personal contacts (close friends, acquaintances, super-connectors, gatekeepers, etc.) Most importantly, some of the advice on sincerity in this book does not stray far from insights in classic books, such as Dale Carnegie's How to win friends, but it is updated for situations in the contemporary workplace, incorporating the existence of social media, new technology or events specifically designed to facilitate networking. 2.5 stars. What I liked: The book has some helpful pointers for those who are shy or who are not inclined to engage with strangers. I would recommend it for new professionals. I think it is also helpful that the author emphasizes that it isn't easy, or natural, even for extroverts to put themselves out there all the time. I also appreciated that he shared some of his rejections, showing that even the best networkers strike out sometimes. What I didn't like: Sometimes the author is too braggy , wh 2.5 stars. What I liked: The book has some helpful pointers for those who are shy or who are not inclined to engage with strangers. I would recommend it for new professionals. I think it is also helpful that the author emphasizes that it isn't easy, or natural, even for extroverts to put themselves out there all the time. I also appreciated that he shared some of his rejections, showing that even the best networkers strike out sometimes. What I didn't like: Sometimes the author is too braggy , which is off-putting. I thought I was going to relate to his blue collar background, but all of his bragging came across as trying too hard to prove himself. Some of his tactics sound highly obnoxious and I doubt he understands how they come across. Who, upon landing from a flight, calls an acquaintance to say "I'm in town but I don't have time for you". Really? I very much doubt his assertion that the friend will just be glad to hear from you at all. I would immediately delete this person from my contacts. I honestly don't get why people rave about this. I didn't find anything insightful in it. Even before I got to the parts where he praises Donald Trump's networking "skills," I could tell he subscribes to that style of manipulation/inflated self worth. The advice is all trivial, nothing you haven't heard a dozen times before. Skip it. I've been doing it wrong! Up until reading this book, I thought conferences were all about listening to keynote speeches / sermons, and then I wondered when all the "conferring" was supposed to happen! Looking back, I can see how some of the best conference outcomes were the relationships built through them. And that's the essence of Ferrazzi's book - how to build and sustain relationships that create synergy and upward mobility. I can think of many applications of his principles and tactics, wh I've been doing it wrong! Up until reading this book, I thought conferences were all about listening to keynote speeches / sermons, and then I wondered when all the "conferring" was supposed to happen! Looking back, I can see how some of the best conference outcomes were the relationships built through them. And that's the essence of Ferrazzi's book - how to build and sustain relationships that create synergy and upward mobility. I can think of many applications of his principles and tactics, which he lays out very specifically, beyond the Fortune 500 CEO context in which this book is set. And it's that context that gets 3 instead of 4 stars. I grew weary of the rich and powerful author's endless self-references. Yes he's successful, and he gives credit where credit is due. But I have a feeling that an undergrad from Yale and an MBA from Harvard have a lot to do with his connectedness. Undoubtedly he's a connector, and undoubtedly a lot of us have a lot to learn from him. And if you don't mind being reminded of this every couple of pages, this is the book for you! Cuộc sống của chúng ta là tổng hòa của các mối quan hệ, những mạng lưới đầy phức tạp và đan xen. Đây là cuốn sách cần phải đọc để học được những cách thức tối ưu hóa những mối quan hệ đã, đang và sắp có của bạn. Không chỉ trong công việc mà còn trong cuộc sống. Đời sẽ bớt cô đơn đi một chút, Công việc sẽ dễ thở hơn một chút và tôi tin là cơ hội cũng sẽ đến nhanh hơn nếu chúng ta biết nắm bắt và tận dụng mạng lưới do chính tay ta dệt nên. Bản dịch này không tốt lắm, một số câu văn được biên tập chư Cuộc sống của chúng ta là tổng hòa của các mối quan hệ, những mạng lưới đầy phức tạp và đan xen. Catchy title but this book bored me to tears. I stuck with it for a few months, reading bit by bit, hoping that somewhere i could discover some gem of a wisdom. But each passing day I got more and more nauseated and finally decided to just file it for good. Nothing new in here, just the same run of the mill advice on how to build contacts. Most of the book sounded insincere, cliched - and some parts just sounded like bs to me. The bragging n self congratulatory tone were rally tiring. "Never Eat Lunch Alone" – On how to build relationships in all walks of life with depth and meaning. As Founder and CEO of Ferrazzi Greenlight, he provides market leaders with advanced strategic consulting an Keith Ferrazzi is one of the rare individuals who discovered the essential formula for making his way to the top -- a powerful and balanced combination of marketing acumen and networking savvy. Both Forbes and Inc. magazines have designated him one of the world's most "connected" individuals. As Founder and CEO of Ferrazzi Greenlight, he provides market leaders with advanced strategic consulting and training services to increase company sales and enhance personal careers. Ferrazzi Greenlight strategically leverages the insight of its executives, whose careers span the highest echelons of corporate America, along with principles from Ferrazzi's best-selling book, Never Eat Alone. Widely recognized as a thought-leader among his peers, Ferrazzi is a frequent contributor to CNN and CNBC. He has authored numerous articles for leading business and consumer publications, including Forbes, Inc, the Wall Street Journal, the Harvard Business Review, and Reader’s Digest. An early leader in the quality movement, Ferrazzi was the youngest examiner of the Malcolm Baldrige National Quality Award. He has been named a "Global Leader of Tomorrow" by the World Economic Forum, one of the top "40 Under 40" business leaders by Crain's Business, one of the most distinguished young Californians by the Jaycees, and one of the most creative Americans in Richard Wurman's "Who's Really Who". Ferrazzi's extraordinary rise to prominence, which includes a stint as the youngest Chief Marketing Officer in the Fortune 500, has even inspired a Stanford Business School case study. As CEO of Ferrazzi Greenlight, he draws upon a rich professional history to help guide organizations and business leaders worldwide. Ferrazzi was previously Chief Marketing Officer at Starwood Hotels, he oversaw marketing activities for global brands including Sheraton, Westin, The Luxury Collection, St. Regis, and W Hotels. Ferrazzi also served as Chief Marketing Officer for Deloitte Consulting, a leading global management consulting firm, where he developed and managed the industry's first globally integrated marketing organization. His creative marketing strategy drove the ascent of Deloitte's "Consulting" brand recognition from the lowest in the industry to a primary position and spurred the highest featured growth rate in the industry. Ferrazzi actively supports numerous civic, charitable and educational organizations. He serves on the Yale University Board of Alumni Governors and the Board of Trustees of the Kiski School in Pennsylvania and is also a Fellow of the Berkeley College at Yale. Additionally, Ferrazzi founded Big Task Weekend, an executive roundtable that brings together some of the nation’s top leaders to focus on improving the health and wellness of Americans. Ferrazzi’s interests also include studying the relationship between leadership success and spirituality. He received a bachelor’s degree from Yale University and his MBA from Harvard Business School.